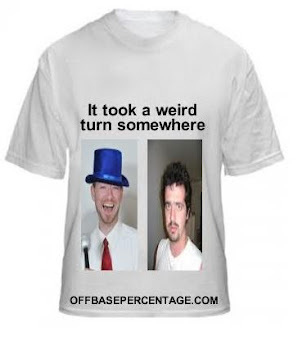 Off Base Percentage: Happy Birthday To Me! While the popular trivia question "what do MTD and Vince DiMaggio share?" is asked in bars across the country, the answer is not "we both hit .000 in 1946 for the Giants." Technically it is accurate but we share the same birthday, September 6th. It's been a long standing tradition, say two-ish years, for me to announce my birthday in blog format so all of you can lavish attention on me. Why yes, I am an only child, why do you ask? But, I'm sure Mitch Moreland is doing the same thing today on some Rangers fan forum. Don't judge us. -Who can forget when Jumbo Latham hit 6 triples in 1877 for the Grays? Shoulda seen that fourth one. Ran like a gazelle. -Oyster Burns hit .307/.388/.430 in his final season in 1895. He tragically died of oyster burns the following summer. Or in 1928 of a random ailment. I'm not a historian. -The only Hall of Famer born on my birthday was spitballer Red Faber, inducted by the Veteran's Committee in 1964 after retiring in 1933. -Bill Murray played one season in 1917. -Delphia Louis Bissonette is a name. Okay, fine, let's move to players born after TV was invented. -Derrek Lee scored some black ink in 2005 leading the NL in hits, doubles, batting average, slugging, OPS, OPS+ and finished third in MVP voting. Who the hell is this Albert Pujols fellow? -Mark Teahen collected four home runs playing for the White Sox and Blue Jays in 2011. If you listen closely, you can hear him sifting through your garbage can. -Jerry Blevins. He's apparently been pitching for the A's for six years in the Angels division but I wouldn't know him if he hit me with an autographed wiffle ball. -The aforementioned Mitch Moreland. Oh, to be 27 again and in the peak of, hmmm, I'm sure I was good at something back then. So, if you haven't sent me cash or autographed Mike Trout goodies yet, I'd appreciate it if you "liked" Halo Hangout on Facebook. Fansided gives me three grapes every time we get a new liker.